Description: Our Personalized Foam Cups are a visually appealing and affordable method to promote your business or personal event. 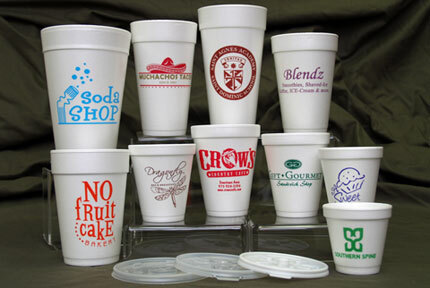 We can print your logo, monogram, custom artwork, or choose from our available typestyles and stock art on a variety of styrofoam cup sizes. From the 4 ounce sampler to the 32 ounce big drink cups, we offer the perfect cup size for your coffee, soda, shake, smoothie, tea, juice, and more. We use CFC free and 100% recyclable polystyrene cups designed to keep beverages at their proper serving temperature on the inside while keeping hands comfortable on the outside. Lids are also available for purchase for all available cup sizes. Available in sizes 4oz, 6oz, 8oz, 10oz, 12oz, 14oz, 16oz, 20oz, 24oz, 32oz. Drinkware is measured as filled to the brim. Available in sizes 5oz, 8oz, 9oz, 10oz, 12oz, 14oz, 16oz, 20oz, 24oz. Drinkware is measured as filled to the brim. Three lines of text in one color ink is included in the price (additional lines for $5.00) Your choice of ink colors include light blue, blue, royal blue, navy blue, purple, orange, black, ivory, cream, light yellow, yellow, tan, light brown, brown, red, dark red, pink, hot pink, burgundy, light grey, dark grey, lime, green forest green, turquoise, gold, copper, and silver. Pricing: 4 ounces: 50 for $47, 100 for $55, 250 for $71. 6 ounces: 50 for $46, 100 for $54, 250 for $180. 8 ounces: 50 for $46, 100 for $55, 250 for $82. 10 ounces: 50 for $47, 100 for $57, 250 for $87. 12 ounces: 50 for $47, 100 for $58, 250 for $89. 14 ounces: 50 for $49, 100 for 61, 250 for $97. 16 ounces: 50 for $49, 100 for 62, 250 for $98. 20 ounces: 50 for $51, 100 for $64, 250 for $105. 24 ounces: 50 for $52, 100 for $66, 250 for $110. 32 ounces: 50 for $55 , 100 for $73, 250 for $127. Quantities are available in 50's, please inquire for other pricing. Prices are for one color ink. If an additional color is required, please contact us for pricing.